to Love God's Way Ministries. We are so glad you have taken the time to come to our site. We hope you will browse though all the links and learn about all the programs we are starting. We are a Faith based Ministry with the goal of spreading God's Love through teaching and healing. We are so happy to announce the release of our latests single TAKE MY HAND. This song is for all the Homosexuals out there looking for a helping hand. The video is available for free download. Make sure that you share the song with your friends and loved ones. 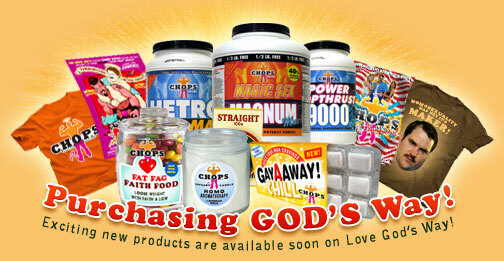 Love God's Way is going to be Open for Business in the following weeks. We had so many orders on the last run we had to shut down to restock. Lookout for our new Homoaroma Therapy Candles, CHOPS T-Shirts and Wristbands, and our signature line of CHOPS Nutrition Therapy. In the coming weeks we are going to be releasing segments of our CHOPS Program, Changing HomoSexuals into Ordinary People. Along with the videos, there will be a very exciting Opportunity for all of congregation. We are going to be offering the once in a lifetime chance to buy into the CHOPS program and share in the Profits and Spiritual Reward. Stay tuned. We have a lot of hot stuff coming down the pipe, including the CHOPS program and a exciting new therapeutic cartoon series. Please take the time and read the material provided on this website. We are here to help. If you or a loved one is suffering from Homosexuality don't hesitate to send them our way. Please Email us with any questions or thoughts. on MySpace and Facebook to learn even more.